Gross receipts taxes are rarely used by states. Only five states, Delaware, Nevada, Ohio, Texas, and Washington, have statewide gross receipts tax (see map below). However, a number of states could be joining to help close budget gaps–this is the wrong approach for states. The majority of states repealed their gross receipts taxes in the 1920s and 1930s and replaced them with retail sales taxes, but in the last two years, states have begun to reinvestigate gross receipts taxes. In 2015, Nevada created its Commerce Tax, after a gross receipts tax failed on the ballot in 2014. In 2016, Oregon voters considered Measure 97, which would have established a gross receipts tax of 2.5 percent on all sales in excess of $25 million. While Measure 97 was defeated by 19 points, Oregon continues to explore possible gross receipts taxes. And now this pace is accelerating. 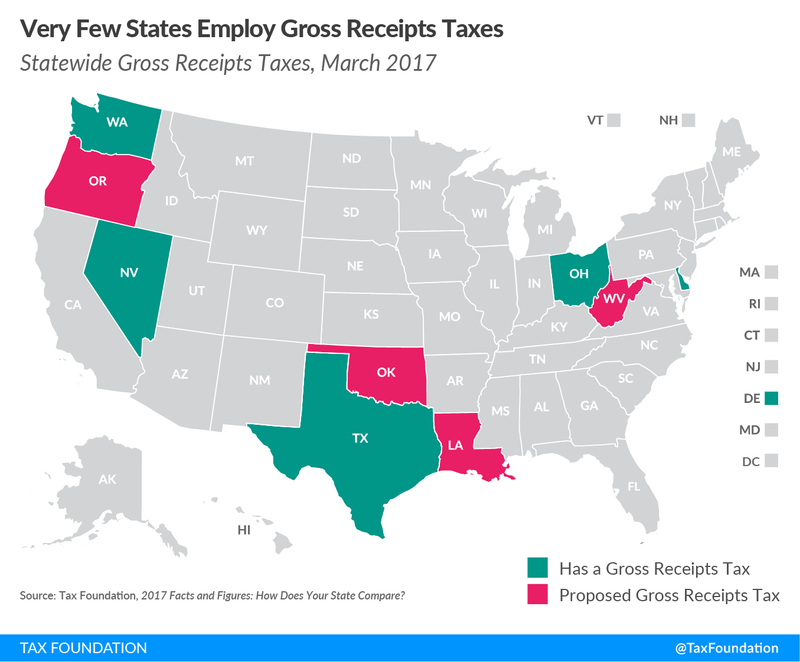 Four states, Louisiana, Oklahoma, Oregon, and West Virginia, so far in 2017 have considered gross receipts tax proposals. (Louisiana Governor Edwards is expected to release details as early as Wednesday.) More could be coming too. Why are states considering a gross receipts tax, given the noted flaws? Gross receipts taxes have two main benefits: They produce large and stable amounts of revenue. Gross receipts tax bases are wider than the entire economy, generating revenue quickly. The same product is taxed multiple times as it moves to the market. And, since gross receipts taxes are assessed on sales, not income, they are not as volatile. They are less impacted by the ebbs and flows of the business cycle as business income varies year-to-year. Under a corporate income tax, firms do not pay the tax if their profits are zero or negative. The same is not true of a gross receipts tax. But these two reasons are not sufficient for adding a gross receipts tax to a state’s tax code. If a state is looking for stability, there are many other options to consider, such as a properly structured sales tax. If a state is looking for new revenue, there are ways to expand current tax bases to produce new revenue. The experience in all four states reveals how gross receipts taxes have a negative impact on the economy. Indiana demonstrates how gross receipts taxes are outmoded, can tax different industries at varying effective rates, and discourage business; New Jersey demonstrates how disproportionate and arbitrary the tax can be, which places an unfair burden on businesses; Kentucky’s tax shows how some businesses are placed at a disadvantage compared to others and that investment levels dampen; and Michigan provides evidence that gross receipts taxes add layers of tax complexity that decrease competitiveness. These state experience are not the exception, but rather the norm. Sadly, a number of states are poised to repeat the folly of their peers, with the resurgence of gross receipts taxes. Largely resigned to the tax trash heap of history, gross receipts taxes are currently being considered as part of tax plans in four states. Hopefully, these states, and others, realize instituting a gross receipts tax is the wrong approach. For more information on gross receipts taxes, click here.